The ring was shipped very fast and arrived a day after shipping. The quality is as expected, very good. I really enjoy the ring and the message I engraved in it is uplifting. Very pleased and highly recommend this seller. Their e-mail and phone support to handle special request was also excellent. Good quality and great customer service even with 3 foot of snow on the way! Beautiful ring! It was exactly what I was looking for and delivery was exceptionally fast. 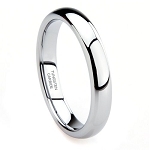 I have purchased 4 of these rings recently and they are beautiful and durable. Ordering and shipping were both a breeze and they arrived literally within days of ordering. My husband and I both love them. The ring is beautiful and my wife was thrilled. I can’t believe how fast it came. I purchased this ring for my wife at Christmas time. She absolutely loved it. Great quality. 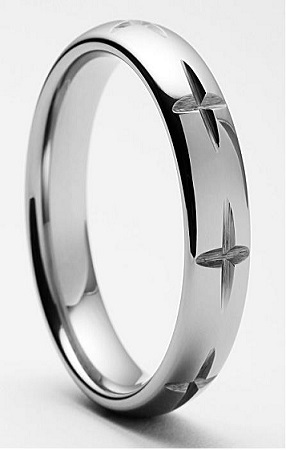 This ring is absolutely lovely. I love the crosses. I actually bought it as a gift and the new owner loves it too.